Isabel’s Cottage is a traditional luxury Lakeland cottage situated within a minutes’ walk to shops, bars, restaurants, cafes and close to Fitz Park and an easy walk to the lakeshore and Keswick Theatre. This is an ideal cottage for two, cosy, central, quiet, well finished and with an attention to detail. The Lounge has everything you could want including reclining leather sofa and a log burning stove. A smart TV means you can log into your own streaming service to watch movies etc. 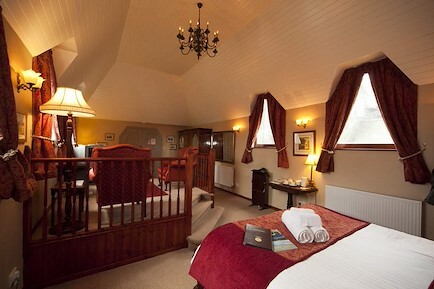 The bedroom has a King-size bed and luxury en-suite walk in shower room. To the front of the cottage is a small outside space with a bench on which to relax and pass an hour or two. Parking for 1 car. (you should note that entry to the car-park is down a narrow alley). There is plenty of unrestricted on-street parking close by. Tithe Cottage offers excellent accommodation for couples close to the town centre especially now with the added benefit of free entrance to the highly rated Oxley's luxury spa at Underscar, approximately only a 5 minute drive from the property. It is a traditional, cozy, slate built, one-bedroom barn conversion in a courtyard setting less than a minutes walk to the center of Keswick town. This is an ideal location for those wanting to be private yet within easy walking to shops, lake, pubs etc. On the ground floor there is a double bedroom with fully fitted wardrobes, dressing table etc. The shower room is also on this floor and has shower cubicle with electric shower, WC and wash hand basin. Upstairs there is and open plan lounge and kitchen area with breakfast bar. High beamed ceilings add to the traditional feel of the cottage. This is a nice bright room with lovely co-ordinating fabrics that give a very homely feel. Facilities include FreeSat TV, DVD player, docking station, radio, comfortable leather settee, fully equipped kitchen with electric oven and hob, fridge, microwave etc. This is an ideal cottage for couples wanting to be close to the centre and yet be very private and a little off the beaten track. There is private parking for one car, washer/dryer and central heating. One bath and one hand towel provided per person. Excellent accommodation close to the town centre, ideally located for those wanting to be private yet within a stones throw of the shops, bars, restaurants, cafes and Parks. An easy walk to the lakeshore and Keswick Theatre. Your enquiry will be sent directly to Tithe Cottage, Isabel Cottage & Sams Cottage. Please fill in as much detail as you can.